The link to Warley Quinborne's site has been added and the Wiki also updated. Try it here. Staffordshire Chess Association New Website Launched..take a look!! The new website is – www.staffordshirechessassociation.co.uk. 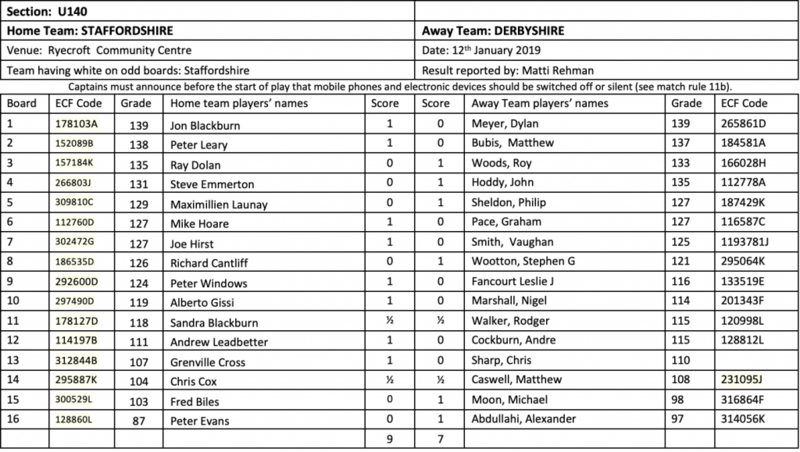 Last night's Rock Cup quarter final game has been added between Andrew McCumiskey and Geoff Rosser here. Ray Dolan reports that there is a new Cannock & District League website. Follow link from our links page here. All teams have now submitted their initial team registration lists and they are shown on the 'Players' page here. A New Season is with us again!! is now complete including the Wiki which should be considerably faster. Thank you for your patience while this was done. New Season is with us again !! Wolverhampton and Bushbiry's players have now been added to the Players page. Only Telford are now missing. Registrations added for Boldmere St Michael, Kidderminster, Lichfield, St George's and Rugeley. See the players page for details. The 2015/16 registrations have now been loaded for champions Stafford. See here. The 2015/16 registrations have now been loaded for Rushall, Walsall Kipping and West Bromwich. See here. The 2015/16 registrations have now been loaded for Brewood and Stourbridge. See here. Bushbury have moved venue to Springvale Sports and Social Club, Millfields Road, Bilston. See the Wiki here for more details.